CRIMINAL MINDS OVERNIGHT RATINGS FOR "CHILDREN OF THE DARK"
Fox was first again at 9 p.m. with a 7.8 for “Truth,” while ABC took second with a 3.3 for the first hour of “Lost.” NBC was third with a 2.3 for “Law & Order: Criminal Intent,” CBS fourth with a 2.2 for a repeat of “Criminal Minds,” Univision fifth with a 1.7 for “Pasion” and CW sixth with a 0.3 for a “One Tree Hill” rerun. CRIMINAL MINDS CHAT WITH CM AUTHOR MAX COLLINS. Criminal Minds: All the writers for Criminal Minds have imdb pages. On the bottom of an imdb page there is a message board. I recently looked at the pages for the Criminal Minds writers and they are not as active as the pages for writers of other TV shows. Since we have entered Criminal Minds rerun hell this would be a great time to correct the situation. Here are the imdb links for our writers. We need to start a Criminal Minds thread for each writer so that when newbies look at their pages they can get a sense of the wonderful work these writers have done and will hopefully soon continue to do on Criminal Minds. So pick a writer and start a thread or if someone beats you to it then add some postive comments about the episodes the writer has written. CRIMINAL MINDS EPISODE "CHILDREN OF THE DARK" DISCUSSION & SPOILER THREAD. Criminal Minds: Please use this thread to discuss Criminal Minds' episode "Children of the Dark". What did you think of the episode? Criminal Minds spoilers....you have been warned! CRIMINAL MINDS QUOTE & SONG INFO FOR "CHILDREN OF THE DARK". The Cinematic Orchestra is the band, and "To Build a Home" is the song. CRIMINAL MINDS SCREENCAPS FOR "CHILDREN OF THE DARK". Criminal Minds: Shemar Moore, Derek Morgan on Criminal Minds having fun at the Goa Nightclub Party on January 10, 2008. Criminal Minds ratings for the week ending January 27, 2007. Criminal Minds is still in the top twenty and that is great news. Criminal Minds: Matthew Gray Gubler, Dr. Spencer Reid on Criminal Minds, has a photograph being published in a magazine called Fanzine137 (We Are The World - November 2007 - 370 Pages). More information here: http://www.fanzine137.com/index_11.htm Thanks to judes for bringing this to my attention. Criminal Minds: Following the airing of Wednesday night's repeat of Children of the Dark, at 10 pm EST, one of the co-writers of the episode, Dan Dworkin, will be joining us in the chatroom. Please email Stacy (slashgirl@gmail.com) for the password. MICKEY MOUSE IS THE NEWEST UNSUB ON CRIMINAL MINDS. Criminal Minds starts repeat hell tomorrow night. Until the WGA strike is over we will be getting a weekly Criminal Minds repeat. Doesn't that sound like fun? I love watching Criminal Minds repeats once in awhile but a weekly dose of it is just too much. Please call DISNEY, 818-560-1000, and tell them that you don't think Walt meant the company should screw the writers from being fairly paid when he made the above statement. 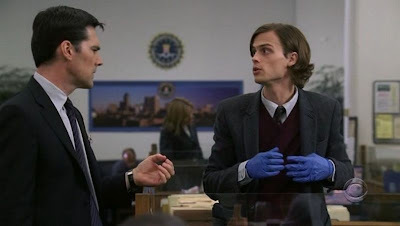 CRIMINAL MINDS: MATTHEW GRAY GUBLER IN "SCARF DAY"
CRIMINAL MINDS PAGET BREWSTER WAS PRANK'D. 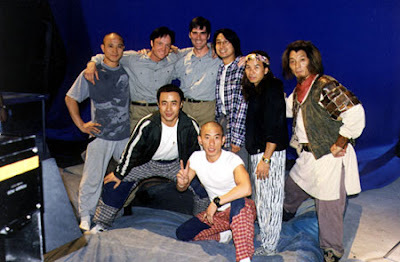 by Raviv Ullman on the set of "The Big Bad Swim" in Dec 2007. Paget Brewster obviously has a great sense of humor. Video courtesy of luckyblue07. Criminal Minds: We have no more new episodes of Criminal Minds until the writers strike ends. Let's hope the strike ends soon and the writers, cast and crew of Criminal Minds can get back to work and salvage the third season of Criminal Minds SOON! Criminal Minds: Matthew Gray Gubler, Dr. Spencer Reid on Criminal Minds, discusses "Alvin and the Chipmunks"
JOE MANTEGNA TALKS ABOUT "STARTER WIFE". 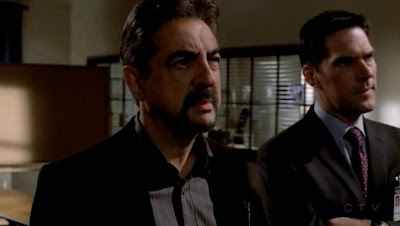 Criminal Minds: Joe Mantegna, David Rossi on Criminal Minds, talks about "Starter Wife". Criminal Minds: The third Season of Criminal Minds has been awesome so far and while we wait for more episodes to be made I was wondering what your favorite Criminal Minds Season Three episode is so far. Criminal Minds: New Contest starts on Jan 28 and ending at noon on Feb 2nd on the Criminal Minds Fanatic website message board. Win a 4x6 autographed picture of Paget Brewster, Emily Prentiss on Criminal Minds. Find as many old threads as you can and post something of substance (meaning, a comment of at least 25 words that is relevant to the thread). At the end of your comment place the number that corresponds with how many of these you have found. Now let me make this very clear and fair. Even if someone beats you to the red warning message, if you are posting on an old thread it stills counts even if you were not first. Example: you post your 25 plus word comment and then you just add #4 (or whatever number you are up to). We started this message board long after the show first aired so it would be nice to bring the board up to date and discuss older topics. Criminal Minds writers Dan Dworkin and Jay Beattie, writers for Criminal Minds, wrote six episodes of "L.A. Dragnet" (Riddance, The Magic Bullet, For Whom the Whistle Blows, Artful Dodger, Cutting of the Swath and The Big Ruckus). Jay Beattie told us in the Criminal Minds chat last week that they enjoyed writing for this show. I look forward to finding these episodes and watching their older work. They rock the roof writing for Criminal Minds! 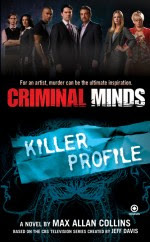 Criminal Minds Book Info: "Criminal Minds: Killer Profile"
Criminal Minds: The second book in the Criminal Minds series written by Max Collins is being released in May of 2008. Here is some info from the publisher: Criminal Minds: Killer Profile by Max Collins. Release: May 2008. The BAU team is called in to help Chicago detectives investigate a series of bizarre murders: a couple shot to death in a parked car; two women strangled in a public park; and a young man's decomposed body stuffed in a plastic barrel. Though equally violent and disturbing, the crimes seem unrelated—until profiler David Rossi makes the connection. Rossi recognizes each grisly tableau, murders modeled on the crime scenes of three of the country's most notorious serial killers: the Son of Sam, Ted Bundy, and Jeffrey Dahmer. Someone is taking the cult of true crime to terrifying extremes...and since there are so many killers left to emulate, Rossi wonders how he can possibly profile a killer who's hiding within the killer profiles of others." 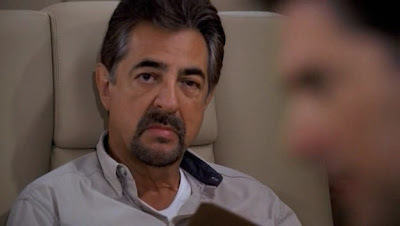 Criminal Minds: Joe Mantegna, David Rossi on Criminal Minds, will host his 8th annual golf invitation tournament on June 30 to benefit Home Ownership Made Easy (H.O.M.E. ), a non-profit organization that assists members of the developmentally disabled community by providing affordable housing. 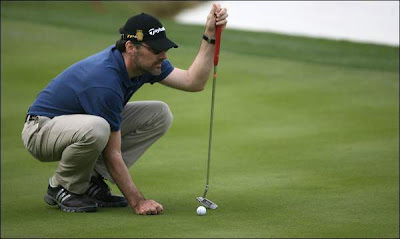 Thomas Gibson, Aaron Hotchner on Criminal Minds, is a member of the Golf Committee for the tournament. More information in this article: http://www.24-7pressrelease.com/press-release/joe-mantegna-to-host-8th-annual-golf-tournament-to-benefit-home-ownership-made-easy-invitational-tournament-set-for-june-30-2008-at-mountaingate-country-club-39520.php. Criminal Minds: Thomas Gibson, Aaron Hotchner on Criminal Minds, will be playing in this year's AT&T Pebble Beach National Pro-Am, taking place from February 4-10, 2008. The list of celebrities playing in the charity tourney is here: http://www.attpbgolf.com/players/celebrities.php. Sunday, Feb. 10 12:00 – 3:30 p.m.CBS. CRIMINAL MINDS: PAGET BREWSTER ON SALE. Criminal Minds: Paget Brewster, Emily Prentiss on Criminal Minds, is pictured above at the Sundance Film Festival in 2004 where she promoted "My Big Fat Independent Movie". The movie is on sale now at amazon.com if you would like to purchase a copy. "My Big Fat Independent Movie" is a feature comedy that includes spoofs of some of the indie film world's most renowned movies such as "Memento," "Pulp Fiction," "Magnolia," "My Big Fat Greek Wedding," "Amelie," "Run Lola Run," "El Mariachi," "The Good Girl," "Pi," "Swingers" and many others. 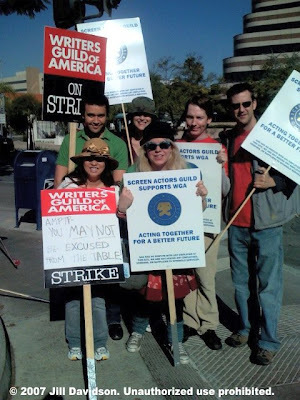 CRIMINAL MINDS: WRITERS STRIKE FELT AROUND THE GLOBE. Criminal Minds fans around the globe are feeling the effects of the writers strike. Here is a link to a German article which talks about TV programming in general. I found it interesting to read that they dub Criminal Minds into german. I can't imagine any voices being as good as the voices of Paget Brewster, Shemar Moore, Kirsten Vangsness, Thomas Gibson, A.J. Cook, Matthew Gray Gubler or Joe Mantegna. CRIMINAL MINDS: WHAT WAS THAT AGENT'S NAME?! Criminal Minds: Jay Beattie, holding his beautiful daughter at a Christmas part in CA, sent along a note about "Limelight" which he wrote with his Criminal Minds writing partner, Dan Dworkin. "Limelight" starred Joe Mantegna, Thomas Gibson, Shemar Moore, Kirsten Vangsness, Matthew Gray Gubler, A.J. Cook, Paget Brewster and guest starred Andrea Roth as Jill Morris. --Having seen much conjecture on the blog about how Dan and I may have named the character of Jill in Limelight after our #1 fan, I am compelled to set the record straight. We wrote Limelight in the beginning of October and at that point in time we had not even met nor had the pleasure of speaking to your fearless moderator. I believe it was Dan who first suggested the name Jill, which also happens to be the name of his sister. Now don't jump to conclusions. I can assure you that her beautiful name is all she shares with the character we created for the show. So you see, it's all just a coincidence. If and when we name a character after Ms. Davidson you can bet it will be a female who is strong, ethical and intelligent - the kind of woman Morgan and Hotch might find irresistible. Wink, wink. The Criminal Minds Fanatic website and the Criminal Minds Conversation Yahoo group will be hosting a Criminal Minds chat on Sunday, January 27th at 4pm est. The password for this chat is Garcia and I am happy to be delivering some exciting news to you during the chat. See you all there and I hope everyone has a great weekend. 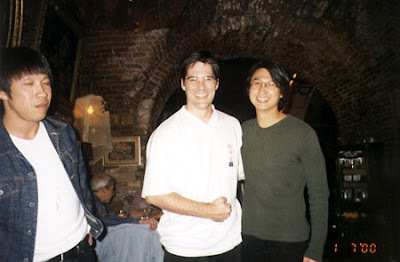 Criminal Minds: Thomas Gibson, Aaron Hotchner on Criminal Minds, pictured with Ridley Tsui, action chereographer on the movie "The Lost Empire", at the wrap party. Performers will include Ne-Yo, Anita Baker, Joss Stone, John Legend and many others. Presenters will include Tichina Arnold, Shemar Moore and Tom Joyner. Five-time Emmy winner Louis J. Horvitz is the executive producer and director of the show. CRIMINAL MINDS MENTIONED IN STRIKE ARTICLE. 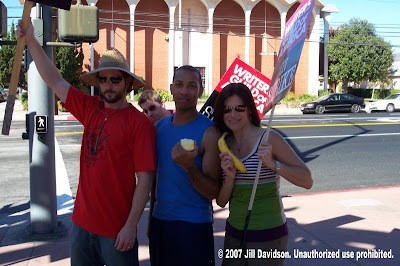 Criminal Minds: Interesting writers strike article. Lets hope our Criminal Minds writers are back writing new episodes of Criminal Minds soon. New Criminal Minds episodes left to air-0-! "Because compensation doesn't exist for a brand-new episode of CSI or Criminal Minds, and replacing audience numbers mathematically and without equivalent programming just isn't comparable. We know this from what we experienced during the 2004-05 NHL lock-out. Our relevant audience didn't go elsewhere - they simply disappeared." thanks to vdovault for the link. Criminal Minds: Here's a picture of Shemar Moore, Derek Morgan on Criminal Minds, at Keith Robinson's birthday party. Pictured with Shemar are Brian White, Lauren London, Ne-Yo and Keith Robinson. CRIMINAL MINDS SCREENCAPS FOR "LIMELIGHT"
Criminal Minds screencaps for "Limelight" written by Jay Beattie and Dan Dworkin and starring Thomas Gibson, Matthew Gray Gubler, Joe Mantegna, Kirsten Vangsness, A.J. Cook, Paget Brewster, and Shemar Moore are courtesy of Stacy. CRIMINAL MINDS OVERNIGHT RATINGS FOR "LIMELIGHT". Criminal Minds: Here are the overnight ratings for "Limelight" written by Dan Dworkin and Jay Beattie and starring Joe Mantegna, Thomas Gibson, Paget Brewster, Shemar Moore, Kirsten Vangsness, Matthew Gray Gubler and A.J. Cook. Criminal Minds song from "Limelight" was "Sweet Beliefs" by Cyann & Ben. Criminal Minds "Limelight" written by Jay Beattie and Dan Dworkin and starring Shemar Moore, Kirsten Vangsness, Paget Brewster, Matthew Gray Gubler, A.J.Cook, Joe Mantegna and Thomas Gibson. CRIMINAL MINDS: SPOILER POST FOR "LIMELIGHT"
Criminal Minds spoiler thread for "Limelight" written by Jay Beattie and Dan Dworkin and starring Thomas Gibson, Joe Mantegna, Paget Brewster, Shemar Moore, A.J. Cook, Matthew Gray Gubler and Kirsten Vangsness. CRIMINAL MINDS: QUOTE INFO FOR "LIMELIGHT"
Criminal Minds quote info for "Limelight" starring Joe Mantegna, Thomas Gibson, Paget Brewster, Matthew Gray Gubler, Kirsten Vangsness, A.J. 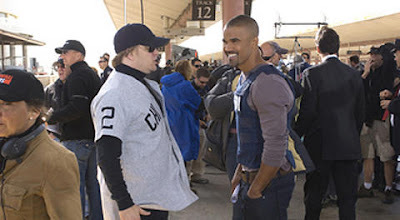 Cook and Shemar Moore. 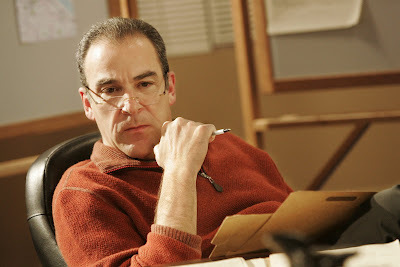 "CRIMINAL MINDS RAISES ITS IQ WITHOUT PATINKIN"
Criminal Minds: Here is a link to a GREAT Criminal Minds article. Congrats to Joe Mantegna and sorry Mandy but this journalist really nailed it! "Criminal Minds" exhausts its stockpile of new episodes tonight, and thanks to the ongoing writers’ strike, episode 13 will likely be the show's season finale. But if this is the end of the season, the CBS crime drama can find solace in the fact that its third season, abbreviated though it was, was still its best. And that is all the more amazing because this season was supposed to be a disaster." CRIMINAL MINDS: HAPPY BIRTHDAY TO ERICA MESSER. Criminal Minds: Erica Messer is celebrating her birthday today. Please join us in wishing Erica a very Happy Birthday! 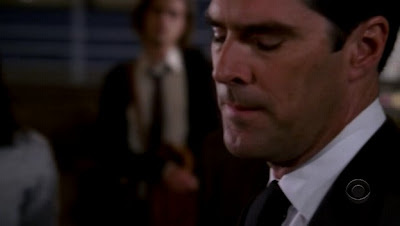 Criminal Minds: The movie "Evil Never Dies" (2003) starring Thomas Gibson, Aaron Hotchner on Criminal Minds, will be airing on TBS, on February 18th at 4 a.m. according to the TBS schedule, here: http://www.tbs.com/movies/movietitle/0,,||341354,00.html. 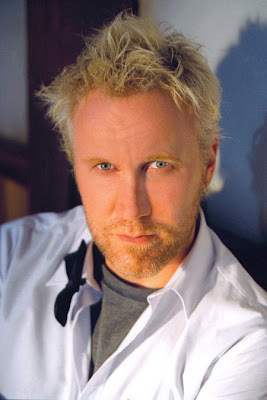 CRIMINAL MINDS: HAPPY BIRTHDAY TO CHRIS MUNDY. Criminal Minds: Chris Mundy, Co-Exec. 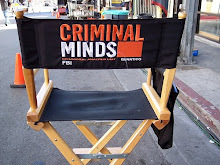 Producer and writer for Criminal Minds, is celebrating his birthday today. Please join us in wishing Chris a very Happy Birthday! 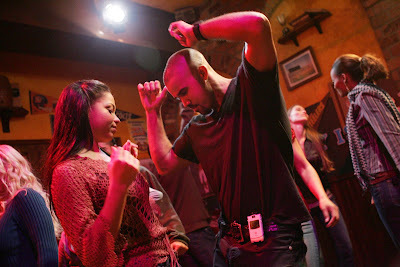 Criminal Minds: The last new episode of Criminal Minds, "Limelight", will be airing January 23rd. After the contents of a self-storage unit purchased at an auction take the BAU to Philadelphia to investigate a series of murders, the local agent becomes the center of the case. To catch the killer, the team must profile the items inside the unit. Written by: Jay Beattie and Dan Dworkin. Directed by: Glen Kershaw. Criminal Minds, starring: Thomas Gibson, Joe Mantegna, Matthew Gray Gubler, Kirsten Vangsness, Paget Brewster, Shemar Moore and A.J. Cook. Guest stars: Andrea Roth, Wendy Braun, Chris Allen Nelson, Madden Page, Michael Cotter, Jeremy Cohenour, Porter Fowler, Chris Snyder, Jason Delane, Zach Hanks, Kelly Lester, Louise Claps, Karen Fatta, Mary Elizabeth Barrett, James Aidan, Cory Tucker, Joseph Gilbert, Nicole Stuart, Michael Chandler, Ruby Campbell. Following the episode, at 10 pm EST, there will be a chat with Criminal Minds' writers Jay Beattie and Dan Dworkin. Please email Jill for the password. As we know, the DGA-AMPTP have reached a deal and the AMPTP & WGA have started informal conversations again. Until the AMPTP & WGA have signed a new contract, we need to call the AMPTP directly to let them know that we, their customers, want them to return to the table in good faith and without anymore sneaky agendas. You want them to bargain in "good faith" this time. You hope the talks start immediately. Remember to be: polite, firm, and brief. 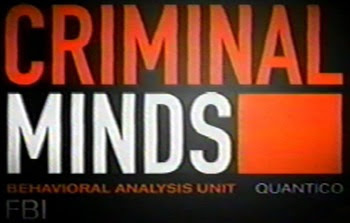 CRIMINAL MINDS: ONE OF CHRIS MUNDY'S PAST PROJECTS. 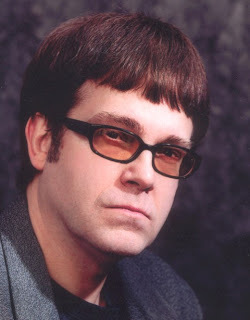 Criminal Minds: Chris Mundy, Co-Executive Producer and writer for Criminal Minds, wrote two episodes (Blank Generation and The Badlands) of "Cold Case" prior to the start of Criminal Minds. This YouTube is of "The Badlands" which aired on October 3, 2004. Written by Chris Mundy and Directed by Tim Matheson. CRIMINAL MINDS: YET ANOTHER BLAST FROM OUR WRITERS' PASTS. Sydney's life is placed in mortal danger when Sloane is informed by his superior that she is the SD-6 mole. Meanwhile, Dixon's life hangs in the balance after he is shot on a mission, and Will realizes that his discovery of Kate Jones' pin could uncover some unexpected information. ** At 4 cents a dvd, how many dvds would we all have to buy of the first season of Alias so Deb could buy Brodie a box of doggie biscuits and Erica could buy a box of animal crackers for her two children? CRIMINAL MINDS: ANOTHER BLAST FROM OUR WRITERS' PASTS. "Hoping to purge Daryl's (Dorian Gregory) friend Mike (Charles Robinson) of a ghostly possession, Phoebe (Alyssa Milano) and Drake (Billy Zane) travel back to 1899 arriving at the place where a cabaret is destined to be destroyed by a horrific fire. Alas, the duo is unable to return to their own time"
CRIMINAL MINDS: ONE MORE WEEK. Criminal Minds: I've popped in a few times over the past week and snuck a post on the Criminal Minds Fanatic blog but Stacy has been doing a wonderful job of keeping the blog up and running. Thankfully she has agreed to run the blog for another week. I will be popping in from time to time but the blog is in great hands. Thanks Stacy! The chat room will have a new password on Wed and you will need to email me and not Stacy to rsvp and to receive the password. 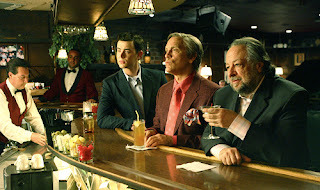 Criminal Minds: Matthew Gray Gubler, Dr. Spencer Reid on Criminal Minds, has a small part in "The Great Buck Howard" which premiered yesterday at the Sundance Film Festival. Thank you to blackpanther for the info. Criminal Minds: These pictures are from the website of Bobby Preston-Weiss, http://www.bobbypreston.net/bresume.htm, who guest starred on the Criminal Minds episode Boogeyman. 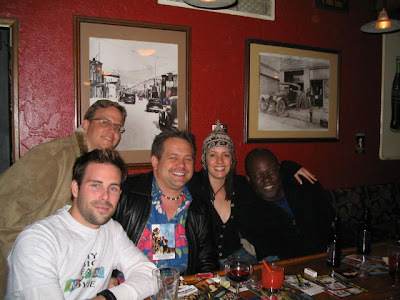 Here, he is pictured with Andi Bushell, the writer of Boogeyman. 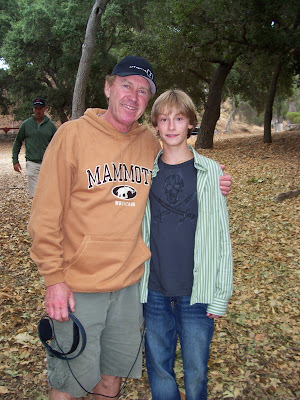 In this picture Bobby is with the director of the episode, Steve Boyum. In these two pictures, we have four of the guest stars in Boogeyman with Criminal Minds' star Matthew Gray Gubler. 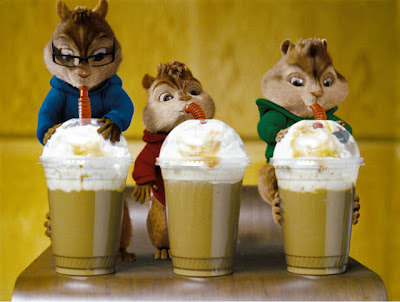 From left to right: Bobby Preston-Weiss, Elle Fanning, Matthew Gray Gubler, Noah Matthews and Preston Bailey. The second season Criminal Minds episode, Boogeyman, was written by Andi Bushell, directed by Steve Boyum and starred Thomas Gibson, Matthew Gray Gubler, Shemar Moore, A.J. Cook, Kirsten Vangsness, Lola Glaudini and Mandy Patinkin. CRIMINAL MINDS: OUR WRITERS' PAST PROJECTS. Criminal Minds: With so few first run episodic shows airing on TV, now is a great time to take a look back at the previous projects that our Criminal Minds writers have written. I borrowed a few VCR tapes and watched one of Debra J. Fisher and Erica Messer's episodes of "The O.C.". It is a totally different type of show than Criminal Minds, but it certainly had the level of excellent writing we have since come to expect from the "Gruesome Twosome" on Criminal Minds. Take a look at the IMDBs of our writers and then ask your friends and co-workers if they have any of these shows available for you to borrow. P.S. : Nothing blows up, nobody died, no head or body parts were in any bags or boxes. 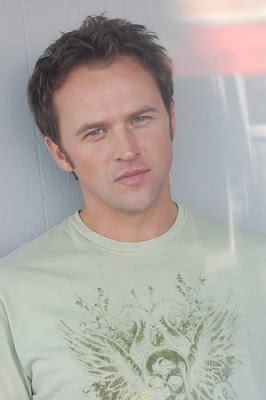 CRIMINAL MINDS GUEST STAR CURTISS FRISLE. CRIMINAL MINDS: PAGET BREWSTER HAS SOME ADVICE. CRIMINAL MINDS: MEETING OF THE MINDS. CRIMINAL MINDS: DGA ANNOUNCES THEIR DEAL. CRIMINAL MINDS WRITERS ARE STILL ON STRIKE! CRIMINAL MINDS: ANOTHER WEEK OF GREAT RATINGS. CRIMINAL MINDS: ANDI BUSHELL WITH NATHAN PEARSON. CRIMINAL MINDS OR REALITY SHOWS? CRIMINAL MINDS: BITS & PIECES. 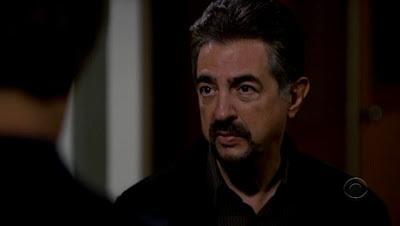 CRIMINAL MINDS: LISTEN TO JOE MANTEGNA. CRIMINAL MINDS: DARE WE HOPE? CRIMINAL MINDS SCREENCAPS FOR "3rd LIFE". CRIMINAL MINDS QUOTE & SONG INFO FOR "3rd LIFE".